Today, I am excited that we are launching Site.com – the only cloud-based web content management system (CMS) built ground up for the social enterprise. This has been a journey over the last few years for me to discover the challenges faced by marketers and their friends in IT who want nothing more than simple, easy to use tools to build, publish and manage their web presence. We found that the tools available today were built in a slow changing world where you had only a website designed for access from desktop computers – before we had YouTube, Facebook, Twitter, iPads or iPhones. We found marketers struggling and frustrated with websites that take too long to change because of long IT backlogs and outdated systems, having to tackle increasingly complex technologies to do seemingly simple tasks like have consistent brand look and feel that can be applied across multiple pages without requiring coding. There are simple, easy to use tools out there but they are primarily focused on very small websites and are not built to scale for enterprises. You are forced to choose between ease of use and enterprise features; between drag-and-drop simplicity and pixel-perfect control over look and feel; between low total cost of ownership and ability to scale. This is not working for the marketers. And, we reject this as a false choice. A simple, elegant cloud CMS that allows you to focus on what’s most important – delighting your customers as they interact with your brand. Now, let me take you through the impact of social and mobile, the evolving CMO landscape, the changing role of CIO and how that translated into Site.com Cloud CMS. Mobile changed everything. Social changed it again. The Facebook Effect: People expect to talk to be able to follow and converse with not just friends but also their favorite brands, products and companies. When the first generation web content management products were built, neither Facebook nor Twitter existed. The Post-PC Effect: Customers expect to be able to get the information they want or need on their favorite mobile devices and at blazing fast speeds. These trends are fundamentally altering the expectations from not only for marketing leaders – from CMO to brand managers, product marketing managers and web marketing professionals but also for IT leaders – from CIO to website developers. As marketing becomes more digital, social and mobile – they need more capabilities delivered more rapidly and often IT has a hard time keeping up with this pace of innovation. A recent Gartner study points out that by 2017, CMOs may have a larger technology spend than CIOs. In many cases, the CIOs are leading the charge by leading this new transformation while others are trying to keep pace – or as the report points out, in some cases marketing has decided to chart it’s on technology course. We believe there is a better way and that convergence of cloud, social and mobile can not only enable CIOs to deliver the marketing technologies that CMOs need; we believe these transformations can only bear long-term fruit and deliver on the full promise of a ‘digital marketing platform’ when marketing and IT are a true partners. We believe that this post-PC internet requires not just some additional features but a fundamental shift in both how you engage with customers and a modern architecture. The Web Content Management Systems (CMS) built for late 1990s are still powering most of the world’s websites – in the meantime, Steve Jobs created iPads and iPhones, the web is no longer just HTML and images but rich and interactive, consumers expect to be able to share content via social media and find out who else is saying what in real time, and to be able to find out about your products, services, promotions and events on Facebook. As we talk to more CMOs and marketers, it’s becoming evident that social & mobile present almost a perfect storm of challenges and opportunities. And marketing is no longer about a one way conversation, it’s about having the customer feel that you are truly listening and talking to them. Marketing now begins when you first hear about a product when your friend ‘likes’ it on Facebook to when you tweet your frustration with getting the product or service – and the response to that tweet. Speed of Social: It used to be the case that you spend months planning a product launch, a new campaign – then a few months producing it and publishing it via print, web and other channels. That luxury is long gone. The cycle time for launches and updates is much shorter. To capture the fleeting attention of the customer, you need to have relevant & fresh content. Radio is Dead: Radio and TV, as Seth Godin points out were a perfect medium for marketers – all you needed was enough marketing spend and you could get captive audience. This was true of the web too in early days when by having a www site and getting enough ‘eye balls’ you could promote your product or service. Now, customers expect to be talking to interact with the brand and they want this interaction to be “human” – treat them as individuals, personalized to meet their needs. Every Employee is now in Marketing: In today’s world everyone in your company that touches or interacts with the customer from the email marketing campaign manager to the person responding to a trouble ticket over phone is in “marketing”. Lifetime Value of a Relationship: Getting a customer to pay attention to you just before or during a transaction is no longer a recipe for success. We want products and companies we chose to do business with to get to know us, with our due permission, and use that customer relationship to offer us a superior service. The early iterations of customer relationship management focused less on building and sustaining a mutually rewarding relationship and more on tactics. It is important for my experience to be richer as a consumer when I give you the benefit of getting to know me as an individual. This transformation means you either transform your company into a company that knows how to leverage the technology shift or be prepared to be eaten by a smaller, nimbler competitor who can. 360 degree view is only 180 degree view of the customer – While often spending millions over the last decade to create so called 360 degree of customer, the digital sprawl means your customer interactions are happening in applications and platforms that are stove pipes. It’s hard to serve a customer if every touch point – the website, the Facebook page and the call center – has only a partial view of the customer. Difficult to make business decisions – How do you effectively manage your digital spend – do you update your Facebook page to get 50,000 more Likes or followers or do you update your website to optimize for organic search traffic? 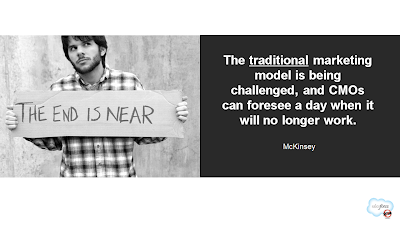 Social experiments can’t scale – Many CMOs and CIOs we speak to bemoan the fact that even when they find a particularly effective mechanism to drive more business value through say a Facebook page or an optimized website for say a product in a particular market, it’s hard to translate that experimental success to scale across other products, markets and channels. While very small businesses may be okay with the one hit wonders, it’s difficult for companies with more than 1 or 2 products to have a meaningful impact on topline unless the success can be replicated both from a technology and process perspective. This is why we are seeing company after company make a move towards becoming a social enterprise powered by a modern, cloud based social enterprise platform. This encompasses multiple aspects from employee social networks to product and customer social networks built around a common social profile. Many IT leaders are fully aware of this transformation and are looking to partner with their marketing counterparts to curb the digital sprawl by not inhibiting innovation but by empowering them with a modern platform for engagement including managing their web presence across web, mobile and social. Time to Market: CMOs want to move at the speed of social – where customers expect realtime updates to content across channels. But older technology was built for a slow changing environment – not build once publish anywhere in real-time. Unpredictable Scale: It’s a CMO’s dream to see a product launch campaign go viral. For many CIOs, it’s a nightmare – how many times do we read about customer facing websites crashing and turn a potential success story into a PR disaster. TCO or TCC: In slower moving parts of the business, total cost of ownership is one of the key metrics for making an IT decision – and there is ample evidence to suggest that cloud applications and platforms have an edge. But the right question is not the total cost of ownership – it is: What is the Total Cost of Change? In fast evolving world of marketing, ability to respond fast to changing market conditions is ever more important. The last generation marketing solutions including content management systems were built for periodic launches, predictable loads and optimized to lower the cost of ownership under those scenarios. The game has changed. We need a CMS that can offer faster time to market and can deal with unpredictable response without overbuilding or overpaying for capacity and do so with the goal of minimizing the time, effort and money it costs to change. CIOs that can deliver a solution to their marketing counter-parts that has the lowest cost of change are enabling marketing agility. 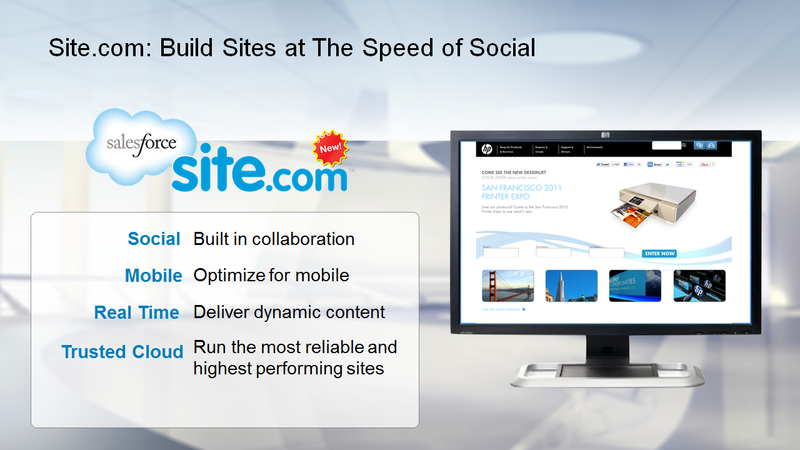 Site.com is a cloud CMS built for this new era. We are delivering to our customers a CMS that is built ground up for the challenges outlined above and to give marketers the agility they need without burdening IT with having to worry about servers, databases, firewalls, routers, content delivery networks and several other pieces that must be put together, scaled and tested in a traditional on-premise CMS – and all this is built on 13 years of proven technology that is trusted by over 200,000 customers. The on-premise legacy CMS systems have run their course. We think there is a better way forward and its built with the following core tenets. Built for Cloud: After a decade of rapid growth, even the legacy vendors have found religion in cloud – and for good reason. In order to meet the challenges like faster time to market, you need a CMS that’s built for the cloud and not bolted on, or simply a hosted outside your firewall – as I like to point out just because you put a car on a ferry, it doesn’t turn it into a boat. Let’s start with – time to market – can you really afford the time (and money) to buy a CMS, the app servers, the databases, the hardware, the network capacity – and make it all work together in time to launch your latest product or event. And even if you do have a system already setup and ready to go, how do you deal with a sudden spike in interest when fortune (or misfortune) strikes you. Site.com, like all of salesforce.com services, is built multi-tenant – and this means that a spike in traffic for you is likely only a minor blip for us. Site.com is elastic and can scale without requiring hardware or software upgrades because its built on a multi-tenant cloud platform. Integrated with CRM and the Salesforce Platform: Websites and social pages are designed to typically either educate, inform and acquire new customers or to service existing customers. Site.com comes with pre-built integration to our Sales Cloud so capturing leads for a marketer is as simple as dragging and dropping a form on a page. You don’t need to write jdbc code, install connectors, configure DMZ ports – all tasks that typically require getting on the IT backlog. The data shows up in database.com that powers Sales Cloud. The same is true for customer service and support websites – no integration required. Even if you are not a customer that uses Sales Cloud or Service Cloud, Site.com can simply capture the data as custom tables in the built-in database. Force.com applications can similarly now capture data or display data on a website. Site.com is open – this means you can connect to other sources of data that could be residing on-premise or on another cloud provider – leveraging database.com REST APIs. More than a CMS: While Site.com is meant to solve the same problem that legacy web content management systems do, it does much more. Site.com includes a WYSIWIG website builder, it includes all the infrastructure you need to run your website and as I mentioned above it includes database.com functionality. In some ways comparing Site.com to legacy CMS is an apples to oranges comparison because they only help you build and manage the content on the website but IT must shoulder the responsibility of integration of all the hardware and software needed to actually run a website, must figure out how to scale the website and keep it running 24x7. Built-in CDN for Speed: In addition to keeping the website up and running 24x7 and scaling it, you need to deliver content to global audiences at blazing fast speeds. This requires leveraging content delivery networks that can cache the content globally and deliver it optimally. 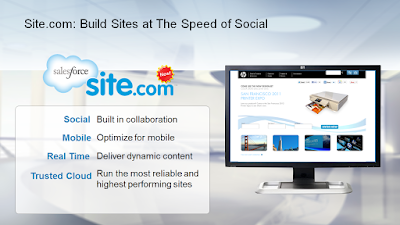 Every Site.com website gets the benefit of our integration with a leading CDN. All you have to do is hit the publish button. There are many other features packed into Site.com but I wanted to highlight a few key features especially the ones that make the lives of marketers easier and reduce the burden on IT due to fundamentally different and superior architecture than legacy CMS built ground up for the social enterprise. Heroku for Facebook Apps: Heroku is the only platform built right into the Facebook developer experience. As Director of Facebook Platform, Mike Vernal says “Heroku makes building and scaling Facebook appliations easier than ever. Developers can focus on their app, getting it in the hands of millions of Facebook users quickly”. Radian6 for Social Listening: In order to engage with your customers, you must listen to them on their social platforms of choice. Radian6 enables organizations to become socially engaged enterprises, with the power to understand and gain insights about social media through metrics, measurement, sentiment and analytics reporting. In summary, we believe that marketers can deliver superior experiences faster to their customers while IT can deliver a platform with lower total cost of change with Site.com. What is our strategy to keep our brand websites, landing pages, corporate websites consistent and relevant as the world moves to be more social? Does our website work on an iPad? How long does it take us from making a decision to act to implementing that change on our web presence? Will our websites be able to handle a day of exceptionally good press coverage or a campaign that goes viral? What is the total cost of change in time, money and effort for us to make a change? 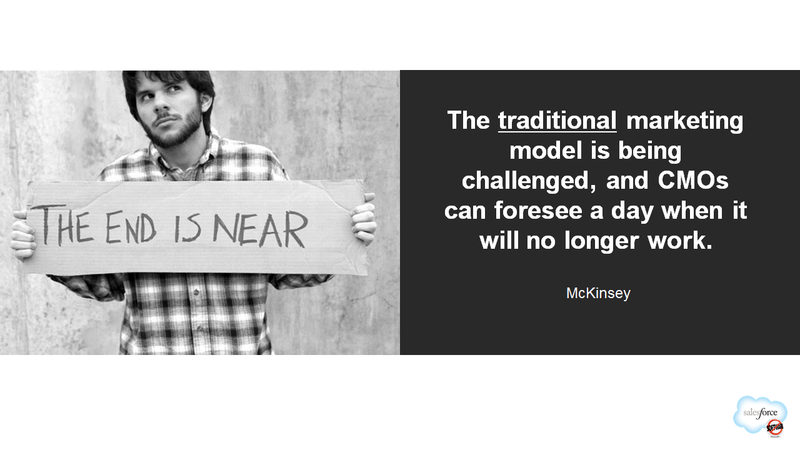 Is that fostering or inhibiting innovation? What would we do differently if we could make changes faster and experiment at lower cost? What if every marketer could try little innovations? And what if we could turn the successful innovations into company wide successes? Are we moving the needle for business? This is the beginning of a conversation. We look forward to hearing from you. We are listening to you on Twitter @SalesforceSite. To learn more about the product including access to free trial, customer success stories and product information, please visit http://www.site.com/ or www.facebook.com/sitedotcom﻿.